TORONTO – ThinkTel, a Canadian leader in IP-based business telecommunications and the only Canadian company qualified to SIP Trunk directly to Microsoft Lync, announced today the launch of a Strategic Partner Consulting Program. 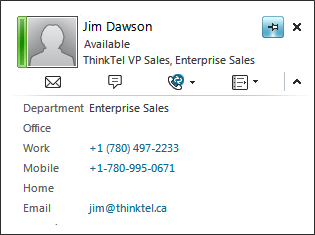 The Program offers a structure where Microsoft System Integrators (SIs) and Large Account Resellers (LARs) can engage ThinkTel for specific areas of expertise around the deployment and management of Microsoft Lync with Universal Voice in Canada. Specifically, ThinkTel’s Lync Consulting Program offers SIs and LARs a structured and time proven methodology to inform, scope, and communicate to customers the options and benefits of deploying Lync. Through this program, ThinkTel provides the Partner with sales training, technical education, network readiness assessments (methodology, templates, or direct outsourcing), design and planning, deployment, and ongoing support for both the end users and the environment. For more information on ThinkTel’s Strategic Lync Consulting Program or to participate, interested Microsoft Partners should contact Jim Dawson, Vice President of Sales for ThinkTel Communications.